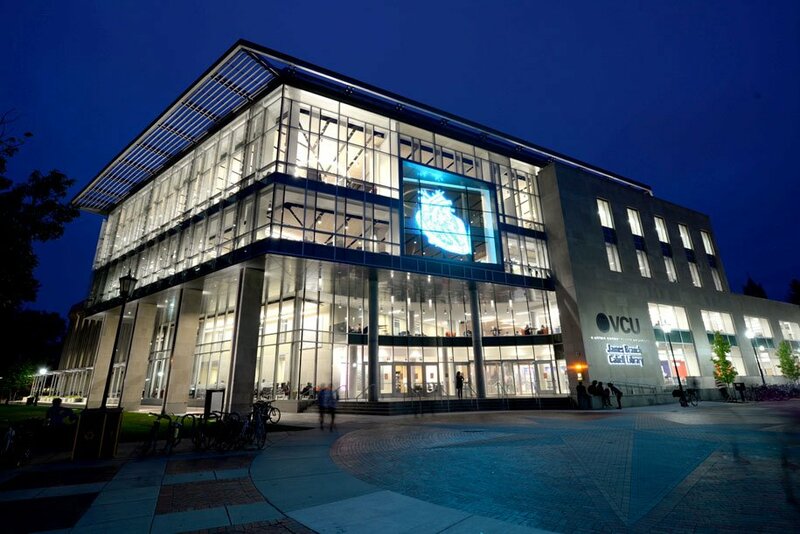 In the latest Mediamesh® project by Moseley Architects, the James Branch Cabell Library at Virginia Commonwealth University is transformed with stainless steel wire mesh interwoven with LED lights. The vitrine where the Mediamesh® sits faces out to the rose plaza; one of the most densely populated places on campus. Two panels of Mediamesh® are interconnected to create the visually stunning and interactive screen that is now a popular attraction for students and visitors. Installers from GKD completed the installation in under two weeks. They had to do the heavy steel work outside the library’s normal operating hours to avoid disturbing post-graduate students using the quiet rooms inside. Eyebolts were placed at the top and bottom of the screen and were drawn almost flush with the top edge of the building. Some of the challenges faced during installation included pulling cable through the ceilings so that the attachment system would be fully concealed once mounted. Another challenge was working on an active library and not being able to use a forklift or boom lift. Pulleys were used instead to be able to lift the steel and put it in place three stories high. Despite these challenges, everything went extremely well during installation. “The final product looked very clean and seamless,” Mike Leonard, GKD’s Technical Director for Mediamesh®, said of the finished project. The big screen that is both visual and artsy fits right in with the VCU campus. Student and faculty made projects, animations, silent films, and events going on at the library are all displayed on the 20 square foot Mediamesh® display. The primary reason the material was specified was that it would maintain views to the outside from inside the library. Not only is the material transparent, but it is extremely energy efficient for its scale too. Mediamesh® uses as much as 80 percent less electricity than traditional billboards. The material is also made of recyclable materials, and offers up to 60 percent transparency - providing natural daylighting and ventilation as well as resistance to weather and temperature. As far as whether the client was pleased with the final outcome, the client was described as being, “extremely happy.” Visitors and students are pleased also; Families, students, and children can be found posing in front of the big screen, admiring the displays of artwork and taking pictures.